so i've been doing cookies for awhile now, right? and yet there are still all sorts of tricks and techniques i have yet to try. the crazy thing is that because of my close proximity to one of the most well-stocked baking supply shops around, i have supplies for all sorts of stuff in my kitchen, just waiting to be used. the top one is disco dust - basically edible glitter. 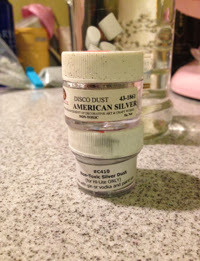 the other is something slightly similar: luster dust, which is still shiny but offers more shimmer than sparkle. my research taught me that the way to use it is to mix it with some sort of clear alcohol, preferably vodka. 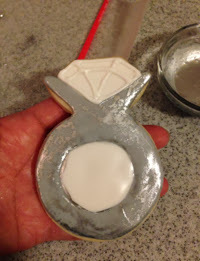 you can brush it on dry icing and the alcohol will evaporate as it dries, leaving the shine behind. now, we all know that i'm not much of a drinker, yes? 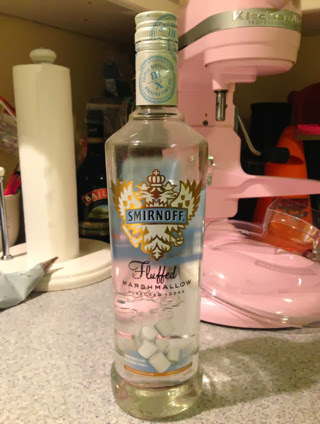 so the only vodka i had in the house was...this. muahahahaha. at least it smelled good as i worked with it. 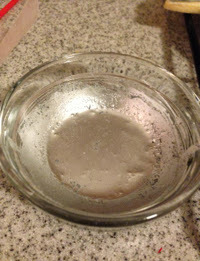 i dumped a little luster dust in, poured some vodka in, and mixed it in. 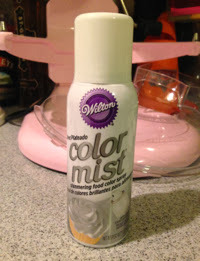 it's basically spray paint for food. 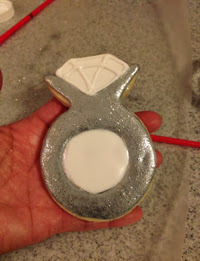 i thought it might be an easy way to add some shine to the engagement ring cookies i was making. 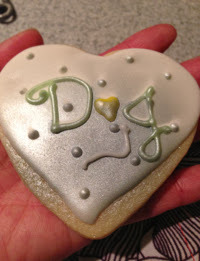 except that i tested it out on a reject cookie and found that it was too difficult to control. no bueno, since i wasn't trying to paint the whole cookie, just part of it. poop. so it was back to the silver vodka and a paintbrush after all. when I tried it out on the first cookie, i was still less than pleased with the results. it may have looked better after drying, but i didn't want to take my chances. so i took some of that disco dust and a dry brush and added some serious bling. i'm not even kidding here - look at this thing! 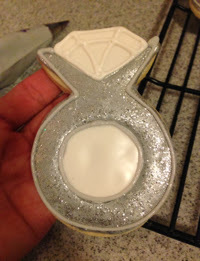 after i was done with all 12 cookies, i decided they needed just a little more detail and outlined it in gray icing. better, right? i really hope she likes these. it wasn't as difficult to do as i'd imagined, but then again i only had a dozen to do. any more than that and this story might have a different ending. heh. Woohoo! I have a feeling I am eating some of those cookies tonight!